Solve all your plumbing problems by calling Beaver Plumbing. We offer a full range of plumbing services for residential and commercial clients Corvallis, OR. Our team performs work at homes, churches, restaurants, medical facilities, and other businesses throughout the region. Contact us today! Increase your water pressure with a new water service line to your home or business. We replace old pipes with minimal digging - or none at all! This is a great way to upgrade your plumbing without damaging your lawn. Our team installs a new 1" PEX pipe from your home to the city water supply, replacing your old galvanized steel, copper, or PVC water service. Old pipes in your home can result in low pressure, dirty water, and other problems. We replace aging pipes with modern PEX piping, using stainless steel crimp rings and brass fittings. Some other companies use plastic fittings to cut costs, but we believe in using the best possible materials to ensure the best results. We also use quarter-turn shutoffs with braided stainless steel supplies to every fixture and new hose bibbs for outside faucets. Our team can complete a full pipe replacement with only minimal disruption for a lower cost than you might expect. When you choose Beaver Plumbing, you'll always pay a fair price. Instead of working by the hour, we work by the job, based on a nationally regulated menu of prices. You'll always be quoted a firm price before the work begins, and you'll never pay extra while plumbers run around town searching for parts. 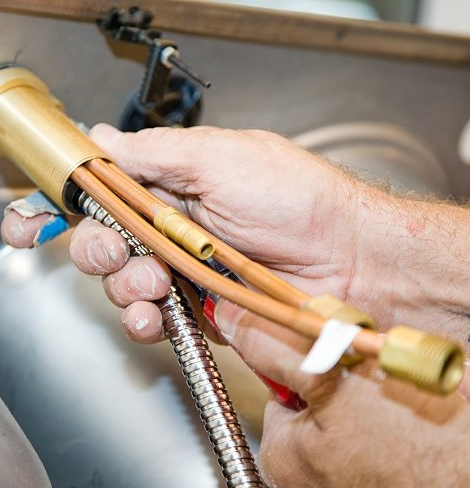 This system also means our plumbers are motivated to complete the job quickly and efficiently. Beaver Plumbing & Heating, Inc.